Level 1: Classes get a mix of brand new dancers and continuing students. There are several different sessions at this level, each with new content, which can be taken in any order. Each session features a different theme. Students are recommended to stay at this level long enough both to cover many of the important elements of Lindy Hop as well as to feel very comfortable with what’s taught before moving to the next level. The aim is to work on developing a solid foundation of dance skills while building a repertoire of moves for social dancing. Discount after 2 full sessions. No experience required to join. Monday Slot 2: The second class on Monday can vary as to what is offered. Often it is a Lindy Hop class focused on a topic. It can also be a specialty class, such as Shag, Charleston or a performance routine. These classes are aimed at experienced Lindy Hoppers with solid knowledge of 8 count basics. The experience level can vary, although they are often appropriate for intermediate to advanced. It is not required to attend with a partner as classes will rotate. An exception may be a routine class. Featured topic for this session: Swingouts! We’ll be getting down to the nitty gritty of swingouts, a move Lindy Hoppers can’t live without! If you are new to swingouts, or already know them and want to work on refining, this will be a class for you. We’ll focus on how to lead and follow to make them feel so good, along with some variations. Included will be a selection of other moves to get you out on the dance floor. Aimed at new and continuing students. 6:00–6:30pm Stay after class for practice! Featured topic for this session: Charleston! Lindy Hop originated with the African American community in the ballrooms of Harlem, and was heavily influenced by Charleston, a huge dance craze which preceded it. Charleston continues today to be a very fun component of Lindy Hop and fits nicely as the tempos go up. We’ll be focusing on the technique and style of classic Lindy Hop Charleston, characteristic of the original Lindy Hoppers. A variety of different partner variations will be included. Appropriate for those new to Charleston as well as more experienced dancers who would like to refine and review. 7:30–8:00pm Stay after class for practice! We have not had enough Black Bottom! It’s been a ton of fun and we’ll be continuing into the next session to work more on all the bits, increase tempos, and put it all together. Open to those who are in the current Black Bottom class. 9:00–9:30pm Stay after class for practice! Please bring a change of clean shoes, either sneakers or soft-soled flat dance shoes. Please bring a change of clean shoes. Private lessons for individuals, couples and groups are available by arrangement, just contact us. Lindy Hop is the original style of Swing dancing. Originating in the late 1920s, it evolved out of the Charleston in the African American communities of Harlem, with roots in both formal European and West African dances. Today it is still wildly popular among groups of dancers all over the U.S. and around the world. Lindy Hop has continued to evolve over the years, influenced by other dance styles and changes in popular music. It is an incredibly fun, creative partner dance mixing the classic with the new. With a character all its own, Lindy Hop is hard to resist! I’d like to thank you both for all the efforts you’ve made to bring some rhythm to our lives. Lindy is the best and you are the best at bringing it to us. Looking forward to all the fun in the coming year. I’d like to thank you for the great teaching and the unforgettable Beantown Camp. In my top five of best memories, three are related to Lindy Hop. Thanks for being my first Lindy Hop teachers and I hope to see you some time next year during one of my visits to Boston! I am still so grateful for the lessons we had with you - you and Tony truly gave us the first dance we dreamed up, and that we (and our guests!) won’t soon forget! Thank you again and looking forward to seeing you soon! A year ago, we were a young couple in (desperate) need of dance lessons for our wedding. Lucky for us, we happened on one of the monthly Uptown Swing events in Brookline, discovered Tony & Aurelie, and now we can’t get enough! Tony & Aurelie are knowledgeable, fun teachers that deliver well-balanced lessons—always adding new moves to the mix, covering (necessary) technique, and giving personal feedback. Lindy is so much fun and we continue to have a blast learning it together (even after the wedding). We have Tony & Aurelie to thank for our new found addiction that will certainly keep us dancing (and laughing) together for years to come. 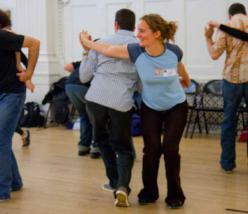 Aurelie & Tony are such wonderful Lindy Hop teachers. I absolutely love their classes. Their fantastic dedication in nurturing their students and in providing a terrific strong supportive Lindy and swing community is a total inspiration. Uptown Swing —their dynamite monthly dance in Brookline, is not to be missed! Their most incredibly phenomenal premier Beantown Lindy Hop Camp for the worldwide Lindy community is truly absolutely amazing beyond words. So you are great dance instructors and are solely responsible for all the fun I’ve had dancing over the last 8 years, as I got better and better, so thank you for all that. …just want to thank you for being such wonderful teachers, delightful people, and powerful advocates and supporters of the Swing dance community! It has been terrific participating in your classes; I learned so very much and enjoyed myself all the way. Just to thank you (Tony) and Aurelie for your wonderful dance instruction…I really appreciated the teaching methods that you and Aurelie used. You broke everything down and allowed us plenty of opportunity to practice (again and again) the moves we’d just learned. Also, you were so very positive and encouraging–not to mention generous with the time you spent with me/us individually! AND, you were great not only at identifying my areas of “weakness”, but at giving very specific and concrete suggestions on how to address whatever it was that was going wrong. Incredibly helpful!